A New Chapter of the Parrot Heads in Paradise has been Hatched !!!! Come out, Join the club and have some rum... I mean fun!!! Or maybe I meant fun and rum. Bring a friend or even a pirate. This will be our first event of many. You won't want to be left behind, walking the plank. 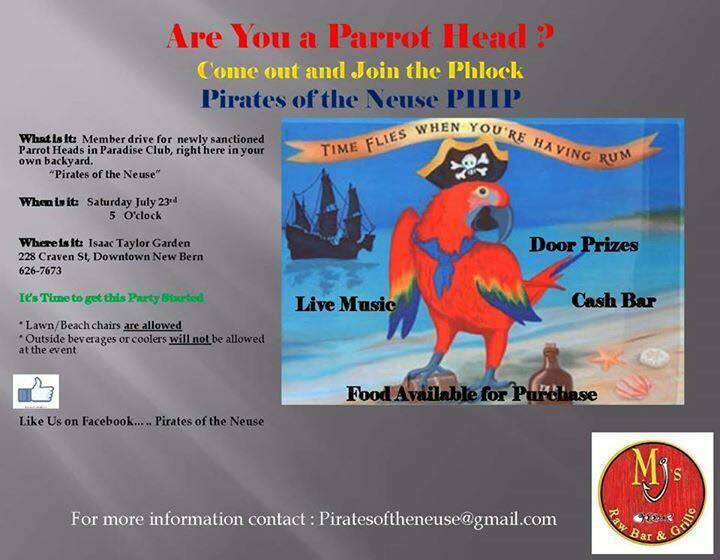 We need you to assemble your crew, garb your first mate, pull out all your Parrot Head Party Gear, unruffle your feathers, sign up and join the Phlock. Cash Bar ......Food....Music and fun. Shake a tail feather and find that lost shaker of salt !!!! To sign up, call Miquela 252-649-1712. 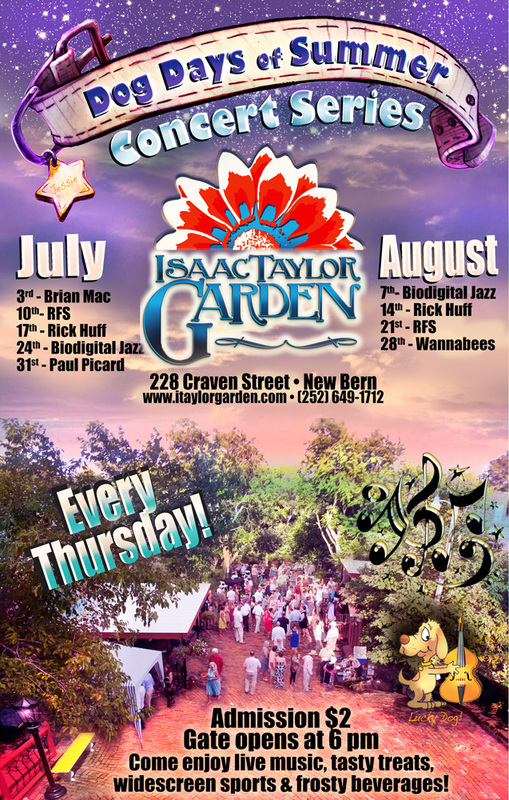 Every Thursday evening in July and August, join us to celebrate the Dog Days of Summer, a concert series at Isaac Taylor Garden. Come enjoy live music, tasty treats, widescreen sports and frosty beverages under the stars during the Dog Days of Summer Concert Series. Admission is just $2 dollars and Gate opens at 6pm. A meet and greet reception with the award-winning head chef Gerry Fong will be held on Sunday, June 29th at the Isaac Taylor Garden, 228 Craven Street in downtown New Bern. Gate opens at 8:30pm. At 10pm, the crowd will the enjoy the episode on widescreen TV to find out the winner of Cutthroat Kitchen. Local executive chef of Persimmons, Gerry Fong gains national recognition on the Food Network. In 2013, Fong made it to the "Competition Dining Series, Fire on the Dock" statewide finals in Raleigh. With all the publicity from recent competitions, the Food Network contacted Gerry Fong to participate in the show Cutthroat Kitchen. Gerry Fong flew to Burbank, California for the taping of the Cutthroat Kitchen episode. The TV show is a competition between top chefs who need to think on their toes as the name of the game is sabotage. "It was so intense," Fong explains, "14-hour days on set, two days straight." Gerry can't name who won during the episode, as he is bound by contract. The episode of Food Network's Cutthroat Kitchen featuring Gerry Fong airs at 10pm on Sunday, June 29th. BENEFIT CONCERT for Tom Parker! Saturday, June 14 in the Isaac Taylor Garden from 1pm-10pm. TomFest music line-up includes: Wannabees, Straightwire Band, Sidetrac Band, John Van Dyke, Andrea & Phil Owens, Brian McDowell, the cast of Pippin, Derek Jordan, Paul Picard, and of course the Unknown Tongues Cajun Zydeco Band!! This is going to be a HUGE day of music, benefitting a world class musician. 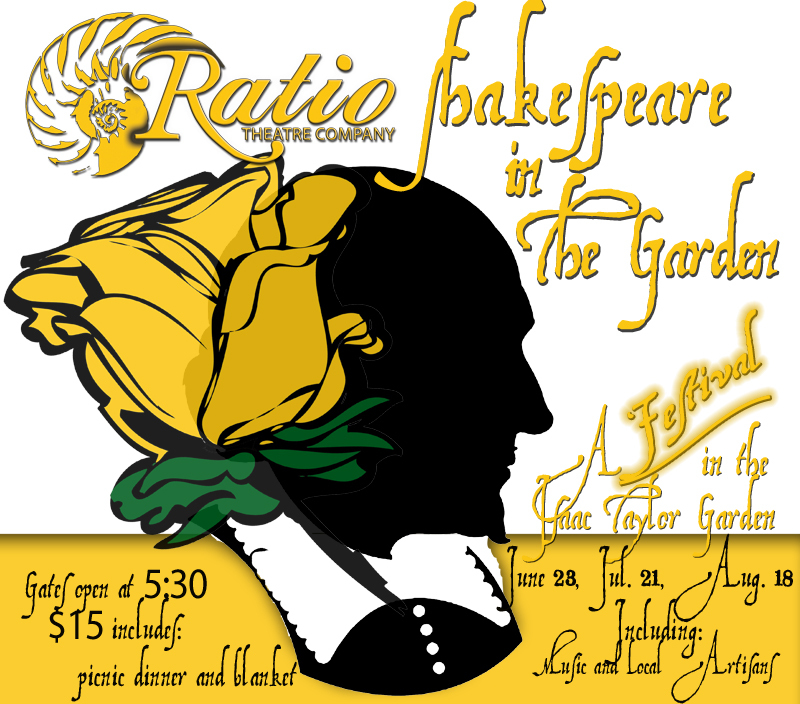 Ratio Theatre presents Shakespeare in the Garden, a.k.a. "Bardin' In The Garden"
Ratio Theatre presents Shakespeare in the Garden. A festival in the Isaac Taylor Garden. 'Bardin' In The Garden includes music, theatrical performances, artisans and much more! The Shakespeare ticketed event is on Sunday, August 18. Tickets are $15 and include picnic dinner and a blanket. Gate opens at 5:30pm. Show starts at 6pm. 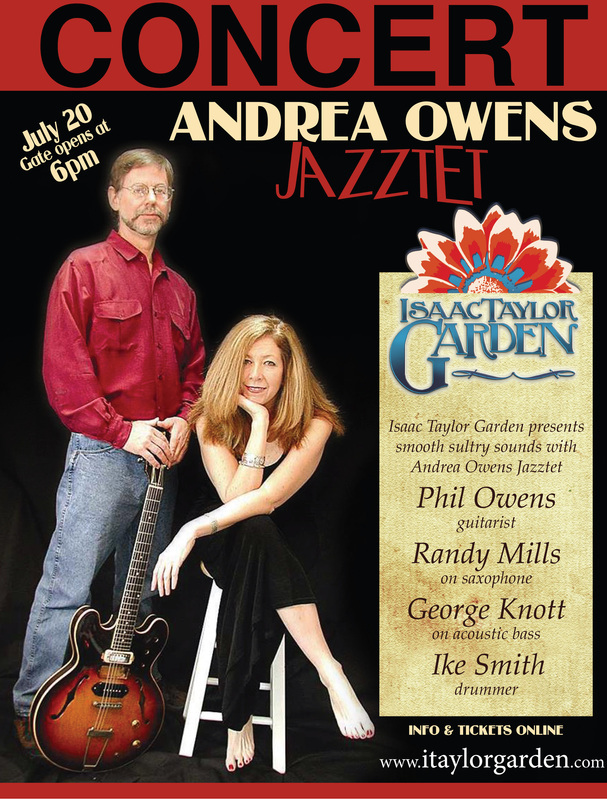 Jazz Concert with "Andrea Owens Jazztet"
Location: Isaac Taylor Garden, Saturday, July 20, 2013. The sweet, sultry sounds of "Andrea Owens Jazztet" featuring guitarist, Phil Owens, Randy Mills on saxophone, George Knott on acoustic bass and drummer, Ike Smith. 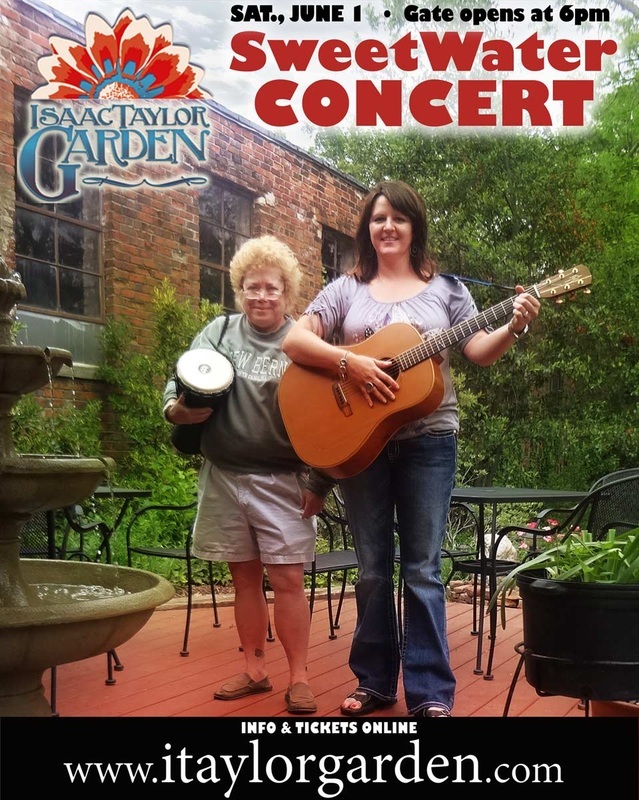 Bobbi Waters and Candy Foust performing as “Sweetwater” in the Isaac Taylor Garden. Live music in downtown New Bern. Tickets sold at the Gate $20. 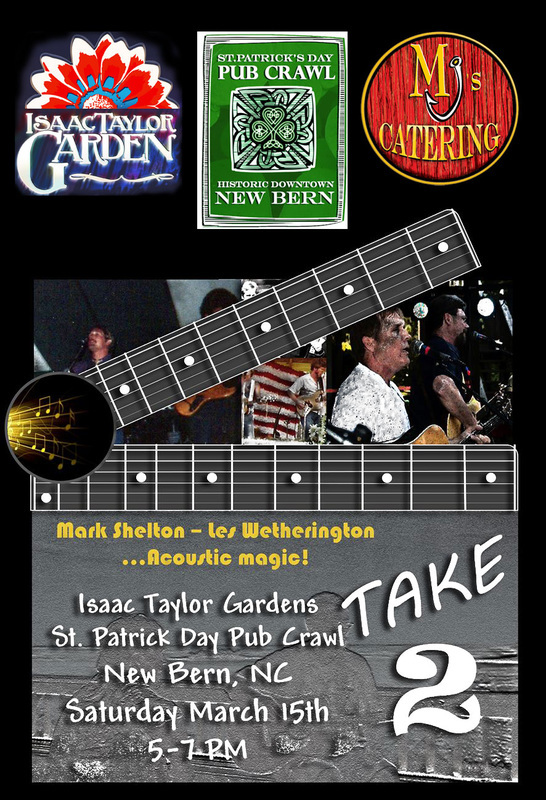 It's time to relax in laughter and song under Spring's early evening at New Bern's premiere event venue, Isaac Taylor Garden on 228 Craven Street. 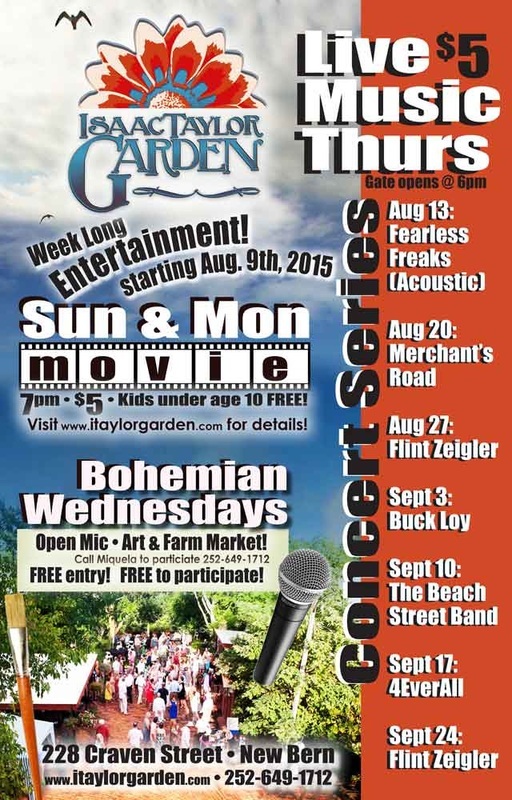 Enjoy great music by Bobbi Waters and Candy Foust in a charming outdoor setting. The dynamic duo of SweetWater will perform in concert on Saturday, June 1, 2013. Gate opens at 6pm. Thursday, May 16, 2013 The New Bern Area Chamber of Commerce will hosted May 2013 "Business After Hours" with Craven Street businesses Mitchell's Hardware , Greater Good Gallery and Isaac Taylor Garden. Meg Wethington, Kendal Turner, Tavis Brunson, CP Maze, and Kevin Lewis. Bloomed on Craven Street! 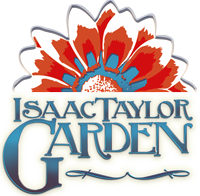 Isaac Taylor Garden opened the wrought iron gates to the public during artwalk! 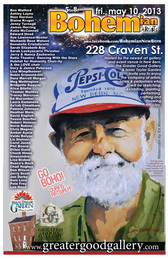 Check out some of the artists in attendance during the March 8 Artwalk! Ben Watford, Ashley Layne, Stan Harmon, Blaine Kruger, James Herring, Sue Lawrence-Nester, Michaelé Rose Watson, Donatella Cristoforetti, Sarah Luckyscarrs Thrasher, Jerry and Nancy Zachewicz, Habitat for Humanity Chair-ity, Gary & Janice Peterson, Robin Griswold-Ott, Dara Merrell Morgan, Meg Wethington, Bridgette Swayne, Thomas Munday, Tracey Marcrum, Ed Macomber, Chris Wagner, Amber Ayala, Liz Steiner, Phil Bowie, Dillon Gunn, Alessandro, Lisa Bisbee, Dan Wilson, Jerry Scott, Jon Derby, Lee Hood, Pete Frey, Carol Jones and more!